This church community was formed in 1975. Our vision was inspired by the fellowship shared by the brethren in the early Church. In particular, the Acts of The Apostles served as a model as we sought to experience a deeper relationship with God and with our brothers and sisters in Christ. Most members were zealous young adults at that time. Early on many people moved into one of several apartment communities to allow for daily interaction with others from the Church. Later, this desire further manifested itself as many began to purchase homes in close proximity to one another. Our congregation possessed no property for several years. We met in basements, living rooms, hotel meeting rooms, a warehouse and rooms in the Indiana Convention Center. Eventually, a Methodist Church building became available in the neighborhood where many members had chosen to live. This building is our current home. �� Many transformations have taken place since 1975. These include entrance into the New Covenant Apostolic Order which later became the Evangelical Orthodox Church (EOC). In the EOC, Fr. Peter Gillquist, Fr. Jack Sparks, Fr. Jon Braun, Fr. Gordon Walker and others introduced us to the writings of Early Church Fathers and Orthodoxy. In 1988, these men and a number of EOC churches entered into the Antiochian Orthodox Church. For a variety of reasons our congregation chose not to enter the Orthodox Church at that time. Check out the book Becoming Orthodox for a detailed look at their story. Thankfully, God has honored our zeal and desire to know Him. He has sustained us through the intervening years and gently guided us on our path to a deeper understanding of Orthodox theology and practice. 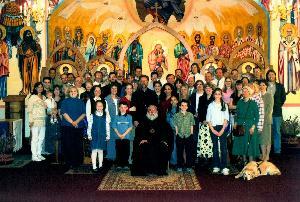 � In 2001, God opened the doors for us to pursue entrance into the Orthodox Church in America (OCA). Then, His Grace, Bp. JOB (now Archbishop JOB) was very kind in his initial meetings with us. In February of 2002 we were received as catechumens. His Emminence, Abp. JOB provided catechetical studies for us with the help of clergy from the Columbus, OH deanery and Indianapolis-area Orthodox clergy from the OCA and other jurisdictions. His Emminence, Abp. JOB received our community as St. John the Forerunner Orthodox Church through the Sacrament of Chrismation on July 10, 2002. � We arrived at Orthodoxy by way of a long and sometimes arduous journey. Yet, we look forward to continued growth and a journey that will continue to deepen our faith. Fr. Zachariah Trent, one of our priests, has written an excellent article giving a brief history of our journey to Orthodoxy. This article appeared in the July-September, 2002 issue of Again magazine and has been reprinted at www.ogreatmystery.com. The Parish Council oversees the tasks of ministry for our church community, i.e. Building Ministry, Finance Ministry, Benevolence Ministry, etc. Members are appointed to this group by the Rector and confirmed by the Congregation, but all church members are invited to observe the Parish Council's meetings. For current ministry information see the Parish Council Secretary. All ministries report to Parish Council at each monthly meeting. The Administrative Ministry is headed by the parish priest and has as its members the Officers of the Parish Council and the Clergy of our congregation. The Administrative Ministry oversees the daily operations of the parish and address legal questions which cannot be easily answered and resolved. This Minsitry reports to the Parish Council in all of its activities. This ministry also is responsible for coordinating all parish communications including the Community Voice, telephone communications (including the "telephone chain"), community communications, press releases and annual reports. This ministry is responsible for representing our parish to the Annual Assembly of the Midwest Diocese and to the triennial All American Council of our Orthodox Church in America. 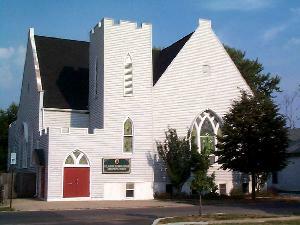 The maintenance of our buildings and Church grounds fall under the jurisdiction of the Buildings and Grounds Ministry. This ministry is responsible for organizing and coordinating volunteers for the Spring and Fall Cleanups, securing all contracted maintenance services, coordinating volunteers for basic maintenance tasks, and proposing to the Parish Council any necessary repair work, improvements, or equipment purchases. The Education Ministry develops, implements, and coordinates all educational programs and activities within our parish. Our parish offers religious educational opportunities for all ages, from preschool through adults. We have a Childrenճ Education Program, a Teen Education Program, an Adult Education Program and an Inquirers Program. The Education Ministry also sponsors and organizes retreats and workshops at our parish, as well as coordinates our parishճ participation in diocesan and seminary-sponsored retreats. While the library is operated by Rodney McCulloh it is ultimately the responsibility of the Education Ministry Committee. It is also their responsibility to purchase materials and equipment needed by the various educational entities listed above. The Finance Ministry coordinates the financial matters of the parish. The Finance Ministry prepares the annual budget proposals for the Annual Parish Meeting, counts and deposits all financial offerings and gifts, oversees the offering envelope system, and prepares annual receipts for contributors. It issues checks for all debts and obligations, remits parish assessments to our diocese and remits funds collected for annual appeals to the OCA. An auditing committee functions under the auspices of this ministry. In support of the mission of St. John the Forerunner Orthodox Church and in resoponse to God's love and grace to us, the mission of the Hospitality Ministry is to help equip our Church to show hospitality to each other, visitors, our neighbors and community; and we will seek opportunities to welcome all into the Church. Through teaching and exhortation, we will encourage our members to extend themselves, individually and corporately, to share Christ's love with those around us. We will provide and maintain a physical setting where hospitality can be practiced, and we will provide the framework for planning and organizing the various weekly events and special occasions that are a part of the life of the Church. By God's grace, as we come to know the hospitality of God Himself, we will be equipped to share His love with the world around us. The Liturgical Ministry Committee is charged with the responsibility of maintaining an active and effective adult choir, Liturgical Readers and Singers, Attendants and Servers, and to attend to the Communion Cloth. They see to it that Vestments are maintained and properly kept. They attend to Liturgical furnishings as well as the availability of candles. The Liturgical Committee works with the Rector and answers to him only in their actions but keeps the Parish Council informed of all financial needs and any actions which affect the unity of the Church Body. The Liturgical Ministry is headed by the parish rector. It coordinates the liturgical life of the parish. The scheduling of and preparations for all services and liturgically-related programs fall under this ministry. This includes the adult choir, altar servers program, liturgical readers program, and all other aspects of lay participation in the Divine Services. This ministry works with the Church Service Ministry to ensure the coordination of all liturgical activities. The Liturgical Ministry is also responsible for the publication of the many liturgical service books used in the parish.